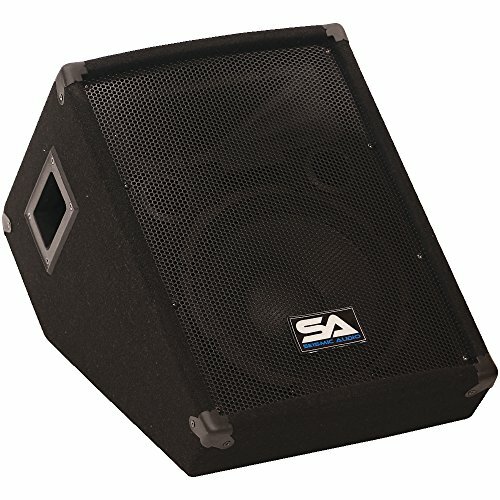 10" Floor / Stage Monitor Wedge Style with Titanium Horn Model #: SA 10MT Single, 2 way 10" Speaker, 150 Watts RMS; 300 Watts Peak, Woofer has 40 ouncemagnet and 2" voice coil, 4" x 10" Horn, Titanium Compression Horn Driver, Two 1/4" inputs and two Speakon inputs, Frequency Response: 65Hz to 16khz, Impedance: 8 Ohms, Sensitivity: 94db, Dual ports, Full metal grill, Recessed Handles, Black carpeted covering, lxwxd: 18"x13.5"x14", Weight: 22 pounds per monitor, Condition: New, One Year Warranty. It's important that you can hear your music on stage. This wedge shaped, 10 "monitor delivers every sound clearly with a 10 "speaker, 4" x 10" Titanium Horn Driver, a frequency response of 65Hz to 16,000Hz, and 150 watts RMS, 300 watts peak power. Great quality monitors are very hard to find, especially at a decent price. The Seismic Audio brand was designed to make the professional musician, as well as the musician low on cash, sound great. With your purchase, you will receive a monitor pictured and described above. So, put it in your cart today and get ready for years of trouble free, crystal clear sound.